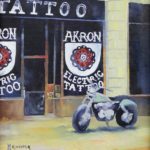 The Akron Area Arts Alliance is pleased to announce the awards for local artists who participated in this year’s 2014 Streetscapes: Akron in Plein Air. 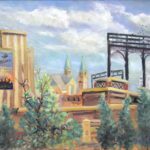 There were a total of 23 regional artists who participated in the urban plein air paint-out who submitted a total of 48 works for the show. 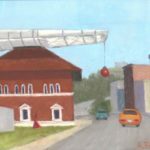 Local painter and designer Brian Shellito has coordinated this competition for four years and each year it has grown in scope. 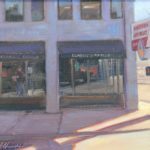 The exhibition opens July 5th and continues through August 16th at Summit Artspace Gallery. 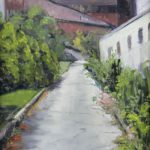 En plein air is a French expression which means “in the open air” and is particularly used to describe the act of painting outdoors, which is also called peinture su le motif (“painting on the ground”). It can also be used to describe other activities where a person partakes in an outdoor environment. Plein air painting is experiencing a revival around the country and the world. 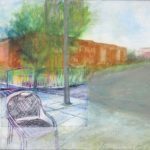 The challenge of capturing the landscape and city streets in a specified time and competitive format for prizes is becoming popular with artists in Ohio and beyond. 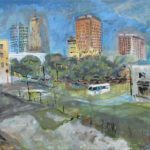 Plein air painting has traditionally taken place in naturalistic landscapes, but more and more competitions are being held in urban environments.